For as you know, Full Moons mark phases of completion, culmination, and fulfillment begun at the previous New Moon so will the February Full Moon time an end to the Trump Shutdown? Possibly! Yet we can't be certain of prognostications when dealing with the unpredictable Uranian Mr. Trump, plus, transit Uranus is involved, planet of unpredictability, with catalyzing action that disrupts or shocks so that things seldom turn out as any normal person would expect. Actually, the only thing we can expect is change. Now as you know, Trump's natal Uranus @17Gem53:34 is last to rise before his natal Gemini Sun and is therefore his oriental planet--his 'guiding planet' of gut intuition--with all that disruptive anarchist Uranus implies. Transit Jupiter @17Sag53:34 on February 1, 2019, acting as leader of a BOWL shape in the chart (advocate of a cause), makes one exact opposition from the 3rd house of the Trump Shutdown chart to Trump's quirky Uranus. 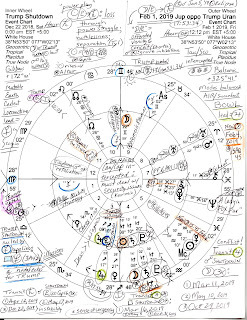 Then on February 4, 2019 comes a New Moon @15AQ45 (horoscope shown) and the seeding of new plans. 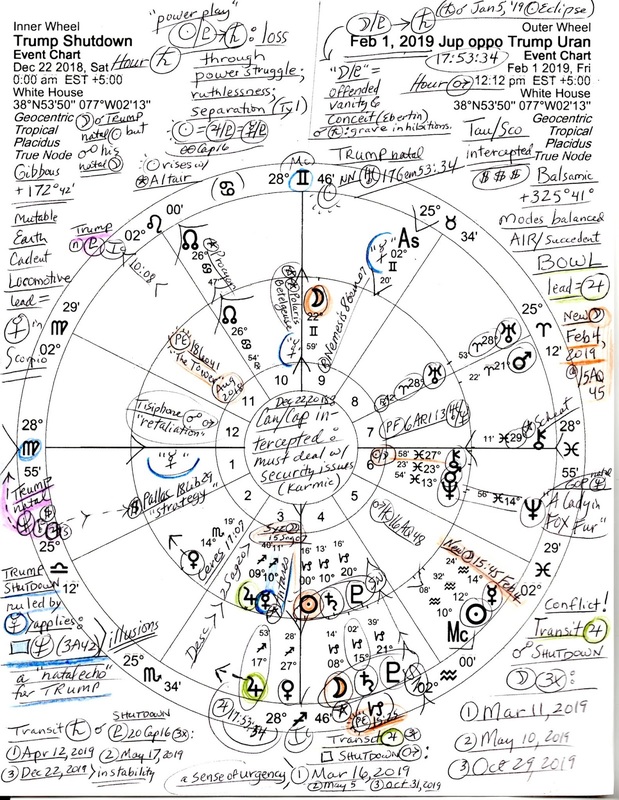 Also note that the Trump Shutdown Moon @22Gem59 conjoined his natal Sun (22Gem conjunct NN) while opposing his natal Moon (21Sag conjunct SN) so he probably felt ego (Sun) satisfaction as he called for his shutdown although he's currently not so thrilled with the mess he created and the fact that he continues to be held accountable for it (Shutdown Moon opposite natal Moon = emotional tantrums?). Trick or no trick in the form of a Senate vote this week, his and McConnell's attempt to switch the blame to Democrats and onto Speaker Nancy Pelosi is not favored although typically the gullible may comply and swallow it whole. I believe that on one level, the Trump Shutdown is Trump's way of retaliating against the American people for voting a Democratic House into power! And it's also his pathetic attempt to usurp power and the spotlight away from Nancy Pelosi and the Democrats which is, of course, against the will of a majority of November 2018 voters. Now across the bottom of the chart/s below you see three major transits upcoming in relation to the Trump Shutdown including tr Jupiter opposing Shutdown Moon (3x beginning March 11, 2019), tr Jupiter square Shutdown Mars (3x beginning March 16, 2019), and tr Saturn conjunct Shutdown Pluto (at critical degree 20Cap16--3x beginning April 12, 2019) which denote a heavy mixture of political conflict--and dramatic changes for Trump, along with a sense of urgency, and unstable conditions in the realms of power and finances. As for the Trump Shutdown chart itself is a difficult trio which forms a midpoint picture of power-craving Sun-Pluto conjunct Saturn with potentials for: loss in relationships due to power struggles (Trump natal Jupiter vs Pelosi natal Jupiter); ruthlessness; separation). Then as you see, on or by February 1, 2019 the trio morphs into Moon-Pluto conjunct Saturn with potentials for: grave inhibitions, depression, and mental and emotional suffering (Ebertin)--Trump's Christmas gift to the American people. Noel Tyl adds: feelings of loss, constraint, and the pressure to regroup forces and plan anew. Well, there's a good idea. 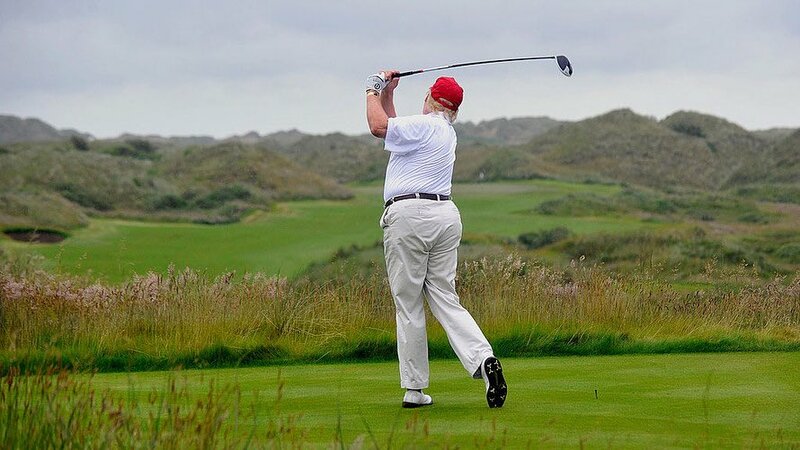 To close, here's a photo of his nibs himself in happier times when he could freely romp and swing a golf club upon greener pastures instead of taking responsibility for the people's suffering he's selfishly caused and the mess he's made which, if not ended soon, will ruin the US economy--just like Putin would do!